Bossy R (ar, er, ir, or, ur) Worksheets: Grab these TEN no-prep and super fun phonics activities! On FIVE sheets students help guide the bee to it's flower by highlighting or coloring prompted words. After finding the correct trail, students write a sentence with the word at the bottom of the sheet. 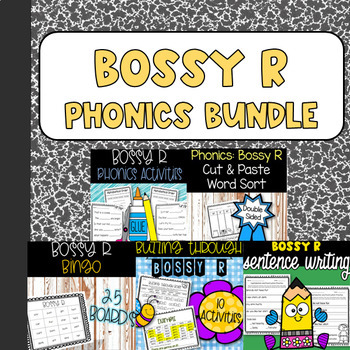 Bossy R (er, ar, or, ur, ir) Activities: : Grab these SEVENTEEN (no prep) phonics based worksheets! Students practice reading, sentence writing, alphabetizing, decoding, and sorting words with the bossy r rule. -5 Buzzing Through Words + 5 Word Box Worksheets: Students highlight a trail of bossy r words to help the bee reach the flower. Afterwards, students write prompted words in correct letter boxes to practice handwriting. 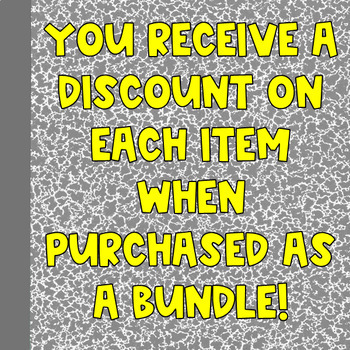 See product for example! -2 Reading Cut and Paste: Students read sentences with a missing word. The cut and paste the correct words into the sentence. BONUS- This product includes 2 alphabetical order pages for early finishers. -3 Proofreading Worksheets: Students read prompted sentences with bossy r words. They rewrite sentences correctly using capitalization, punctuation, spacing, and neat handwriting. -1 Crack the Code Puzzle + Recording Sheet: Students 'crack the code' and match words with pictures using initial sounds. There is also recording sheet to extend the activity.